In Rise and Fall , you’ll be able to lead your people into Golden Ages as well as overcome the challenge of Dark Ages. Each citizen provides +1 Loyalty per turn in their city and a portion of this to cities within 9 tiles. The effect makes it easier to maintain Loyalty in your own cities and also challenges the Loyalty of nearby foreign cities. You may make a Dedication for a powerful gameplay bonus during this age. With every era transition, you make a Dedication, which is a special choice that decides what your people’s focus will be for that age. For example, “Reform the Coinage” in the Industrial Age grants bonuses to successfully completed trade routes, while “Heartbeat of Steam” gives bonuses for each industrial-or-later building completed. New Era Thresholds are displayed to make clear what score needs to be achieved for a Dark Age, Normal Age or Golden Age. During Dark Ages, cities may revolt or declare independence. However, there is a benefit to Dark Ages: special Dark Age policies can impact your rise to greatness. For example, the Inquisition policy adds a +15 Religious Combat Strength in friendly territory, but you suffer a -25% Science penalty in all cities. However, it also becomes easier to enter a Golden Age from a Dark Age. Doing so means a Heroic Age: A Golden Age with additional bonuses such as, for example, making three separate Declarations. Some ways to keep your Era score high include Historic Moments, as well as keeping up with Dedication Bonuses. Historic Moments include founding a Religion, discovering a Natural Wonder or being the first to clear a nearby Barbarian Camp. You can review your Historic Moments in the new Timeline feature at any time to get a better sense of your civilization’s epic history. As Loyalty rises and falls, the borders of the map will change. You can view the Loyalty of any given City by clicking on the Loyalty icon within City Details, which will also give you ways to improve the city’s Loyalty such as establishing a Governor or creating a Cultural Alliance with a neighbor. Loyalty affects not only your borders but even your cities’ yields. When loyalty falls too low, you may lose your city to a revolt entirely. A city that leaves an Empire becomes a Free City and may be brought into any empire that raises their Loyalty. Hide your kids, hide your wife, hide your cities unless you want them snatched from under your wing. Governors impact the Loyalty of your empire and also affect other areas of the game. There are seven Governors, each with their own unique portrait, name, abilities and promotions. It takes several turns to establish a Governor in a city. You can spend Governor Titles on Promotions for your Governor. For example, Reyna the Financier has abilities such as Contractor: allow a City to purchase districts with gold, or Tax Collector: +2 Gold for each Citizen in a city. However, you won’t unlock every governor and promotion in a single game. The opportunities to unlock Governors are rare and primarily unlocked in the Civics tree. It seems like you’ll have to choose between increasing a Governor’s power or recruiting a new one entirely depending on your needs. This adds another meaningful strategic choice to your game. There are whole new reasons to make and keep good relations with your neighbors in Rise and Fall . The longer an alliance, the greater the benefits granted. For example, a Level 1 Research Alliance grants science bonuses to trade routes between the two allies. Emergencies are urgent global events that prompt reactions from every other civ on the map. For example, conquering a City-state or launching a nuclear attack can prompt Emergencies. When this happens, non-allies of the offending nation may join into an Emergency, a temporary way to come together in a time of crisis. Emergencies offer an action to undertake against a target along with a bonus to assist their efforts. If the action succeeds, those who undertook the Emergency will be rewarded, while failure makes the offending nation grow stronger. You can choose to accept or reject an Emergency. We’ve covered many of the new leaders and civilizations heading to Rise and Fall . For example, there’s Mongol leader Genghis Khan, the Cree led by Poundmaker, and Tamar of Georgia. If you’re a fan of discovery and exploration, you’re in luck: new Natural and World Wonders come to Rise and Fall, such as the Matterhorn, Eye of the Sahara, St. Basil’s Cathedral, and the Statue of Liberty. Each has its own gameplay uses, of course. In addition to units unique to each civilization, the Tech tree brings additional global units throughout the different eras of the game. These include Drones, the Supply Convoy, Spec Ops and the Pike and Shot. Rise and Fall makes the path to victory more narrative and global than ever before. The Timeline feature, coupled with the Great Ages, help make your empire’s history feel more like an epic tale than ever before. Governors, Loyalty, enhanced Alliances and Emergencies give you more reasons to interact on the world stage. Civilization 6: Rise and Fall launches on Feb. 8. You can currently pick up the base game plus two DLC at an amazingly affordable price ($12 for a $60 game, dude) by subscribing to Humble Monthly here. 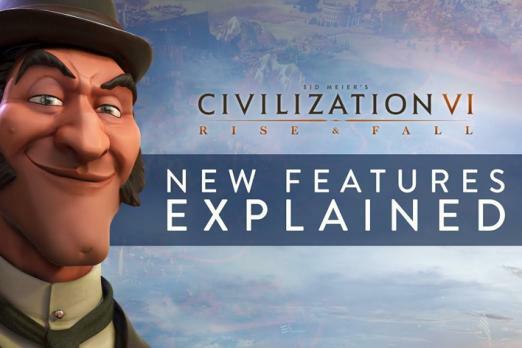 What are you most looking forward to in Civilization 6: Rise and Fall? Feel free to let us know in the comments section below.